Body acne is an underrated problem. More than 50% of people with acne on the face also have acne on the back, chest, and other areas of the body. Unfortunately, as many people are often embarrassed about their body acne, roughly 75% of people with body acne never tell their doctor and seek the appropriate treatment. However, body acne is totally treatable with the use of natural, plant-based ingredients. Similar to facial acne, body starts with the proliferation of bacteria on the skin along with the obstructed sebaceous glands (i.e. "clogged pores), and the subsequent inflammation that causes pimples. 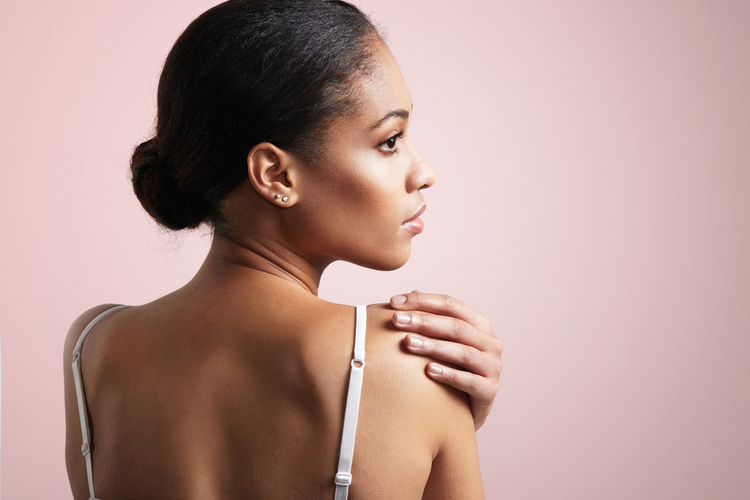 Back acne is the most common form of body acne, but it can also develop on the chest, shoulders, arms, legs, and buttocks. There are also many external factors can trigger or exacerbate body acne. These include friction from tight-fitting and/or sweaty clothes, the frequent use of thick oily body lotions and massage oil, an unhealthy diet, stress, and hormonal changes. What natural ingredients help treat body acne? There are several natural ingredients that have proven to be valuable in the treatment of body acne. Here are the top 10 natural remedies to get rid of back acne fast. 2. Aloe Vera: This soothing plant extract is a quadruple threat with anti-inflammatory, antibacterial, antiseptic and antimicrobial properties. Aloe vera gel can help kill the acne bacteria, reduce inflammation, and promote healing of the skin. 3. Vitamin C: Ascorbic acid is a natural astringent derived from citrus such as lemons and oranges. Vitamin C is naturally antibacterial and helps remove dead skin cells and unclog pores. 4. Green Tea: The compound catechins in green tea have antibacterial properties that help fight acne-causing bacteria. Green tea is also a potent antioxidant and anti-inflammatory agent that can reduce the redness and inflammation caused by acne. Natural ingredients can certainly help with body acne. That being said, the proven most effective way to treat and prevent body acne is with a combination of medical-grade ingredients (i.e. Benzoyl Peroxide and Salicylic Acid) along with plant-based ingredients. This combination, which can be found int he MDacne Body Acne Treatment, results in a significantly more efficacy while reducing and preventing irritation.